Claiming government documents is a tedious and stressful task as one will go back-and-forth and could take several months to get the results. But this citizen made his own research of the rules applied and stood his ground. A citizen went to the Bureau of Internal Revenue (BIR) to process his Certificate Authorizing Registration (CAR). But when he asked how long should he be waiting for it to be processed, the BIR personnel told him that it will take up to 3 months. A week had passed, he went back to the BIR office to claim his CAR but the BIR personnel told him that it would take him 3 months. 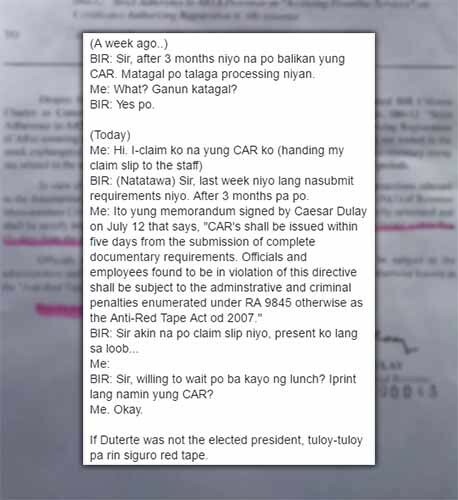 Good thing that he made his research that a memorandum signed by Caesar Dulay last July 12 was "CAR's shall be issued within five days from the submission of complete documentary requirements. 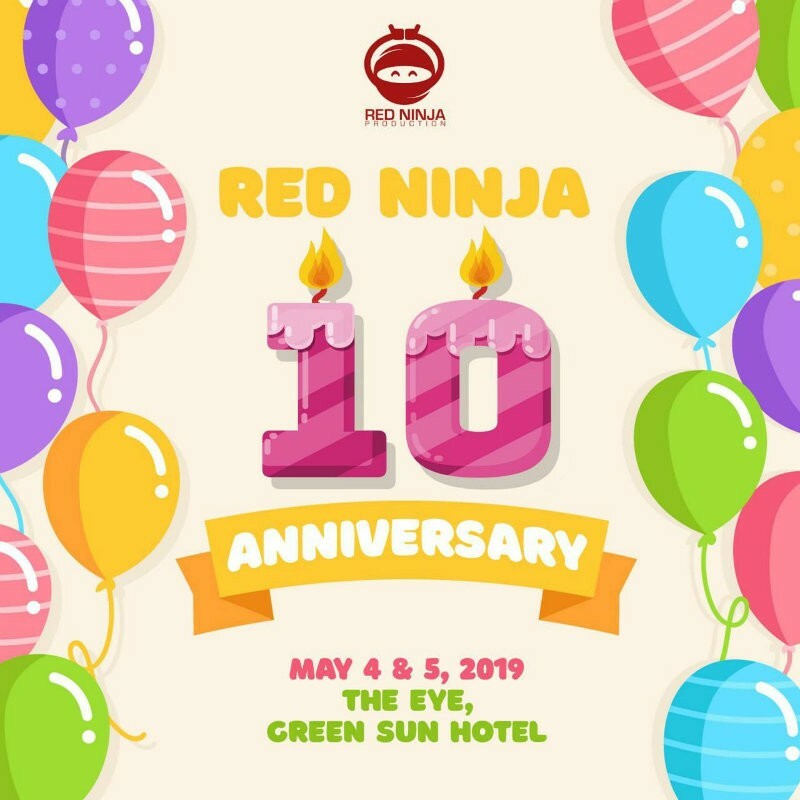 Officials and employees found to be in violation of this directive shall be subject to the adminstrative and criminal penalties enumerated under RA 9845 otherwise as the Anti-Red Tape Act od 2007." 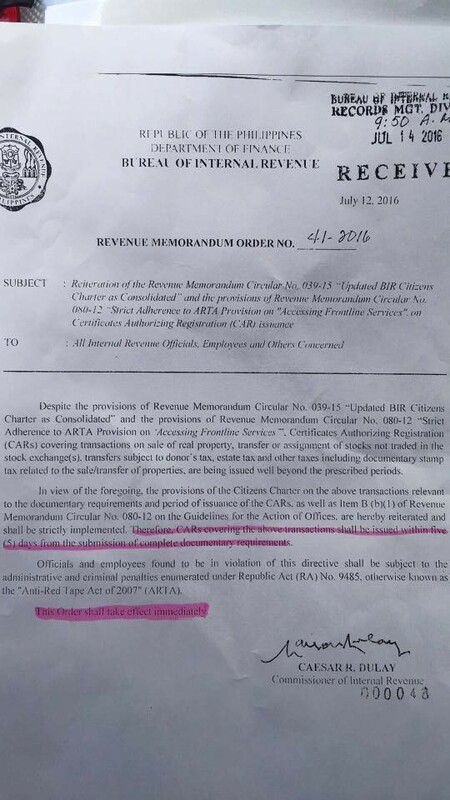 By presenting the memorandum, the BIR personnel then printed his CAR and handed it over to him few moments later. BIR: Sir, after 3 months niyo na po balikan yung CAR. Matagal po talaga processing niyan. BIR: (Natatawa) Sir, last week niyo lang nasubmit requirements niyo. After 3 months pa po. 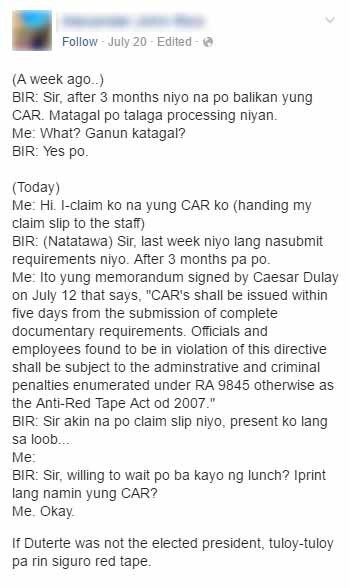 Me: Ito yung memorandum signed by Caesar Dulay on July 12 that says, "CAR's shall be issued within five days from the submission of complete documentary requirements. 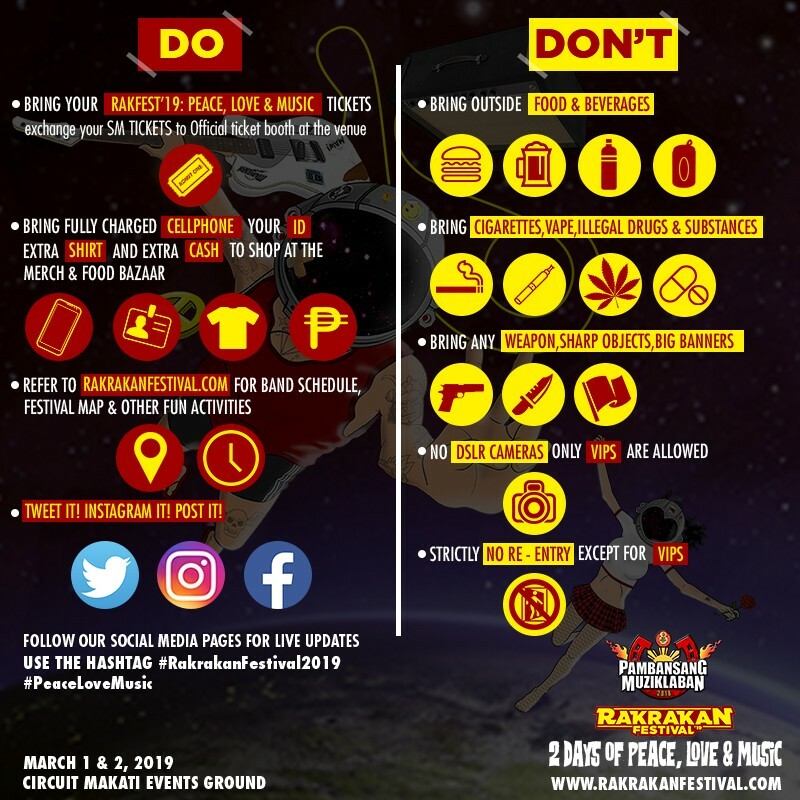 Officials and employees found to be in violation of this directive shall be subject to the adminstrative and criminal penalties enumerated under RA 9845 otherwise as the Anti-Red Tape Act od 2007." BIR: Sir, willing to wait po ba kayo ng lunch? Iprint lang namin yung CAR? If Duterte was not the elected president, tuloy-tuloy pa rin siguro red tape. Lesson learned? 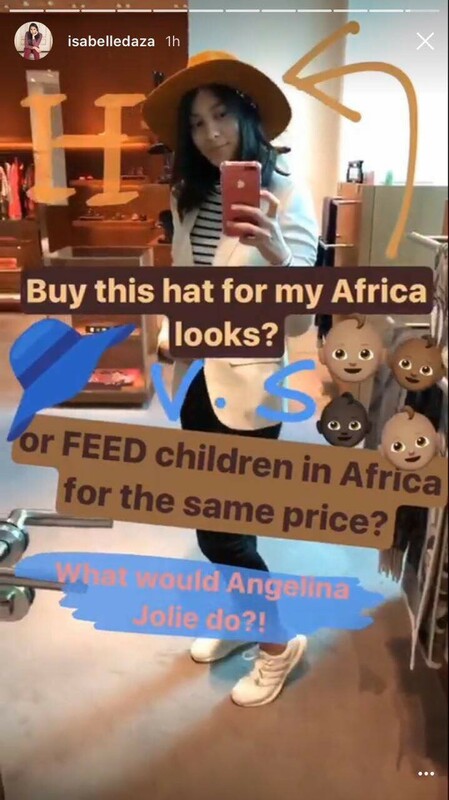 It is best to do your research as to know the latest news and updates with regards to claiming and/or filing government documents as to not be hassled by these ignorant government personnel. Imagine if he didn't do his research regarding the memorandum order, he would be waiting for 3 months for a file just to be validated and printed in a few minutes.